Randall Laureat Cross (born April 25, 1954) is a football analyst and former NFL right guard and center. He was inducted into the College Football Hall of Fame in July 2011. Cross, who was born in Brooklyn, New York, attended Crespi Carmelite High School in Encino, California. He was renowned as a high school shot put champion in the Southern California CIF from 1970–72, when he was named CIF California State Meet champion in the event, defeating future world record holder Terry Albritton and future WWF wrestling star Jim Neidhart both from Newport Harbor High School in the process. He heaved the 12 pound high school shot 67' 6.5" which remains the Crespi school and stadium record. At UCLA, Cross was an All-America selection. As a senior, he helped lead his team to the 1976 Rose Bowl championship over top-ranked Ohio State. Cross began his career as a Center, but was moved to Right Guard for his junior year before playing both Guard and Center as senior on a rare rotating nine man offensive line. On this rotating line Cross started at RG on the 1st unit and then moved to Center when the next group hit the field. He was named First-team All-America in 1975. He was also a First-team All-Conference selection in 1975 In his career, he was a starter in 28 of 34 career games including his final 23. Randy Cross (and many other UCLA linemen) also played collegiate rugby for the school. Randy was inducted into the College Football Hall of Fame in 2010. In 1976, Cross was selected in the second-round of the NFL Draft by the San Francisco 49ers; his 13-year career included three Pro Bowl selections and three Super Bowl championships (SB XVI, XIX, XXIII). Cross' last game as a player was Super Bowl XXIII in 1989. He played center from 1976–78 then guard from 1979–87 before finishing his career in San Francisco at center in 1988. Upon his retirement after Super Bowl XXIII, Randy joined the Miller Lite All Star's cast making a series of popular commercials for the brewing giant. From 1989-1993, Cross was a member of the CBS Sports team that covered the NFC playoffs and Super Bowl XXVI. In addition, he served as an analyst for CBS Radio Sports' coverage of Super Bowl XXIV, filling in for Hank Stram when the latter was stricken with laryngitis and had to leave the broadcast in the third quarter of the game. Cross left CBS (following their loss of the NFC package to Fox) to join NBC Sports as a football analyst for NFL telecasts and a part-time analyst for Notre Dame football games. In 1998, he returned to CBS Sports as a game analyst before serving as a studio analyst on The NFL Today from 1999-2001. He eventually returned to his game analyst duties in 2002. He also co-hosts shows on the Sirius NFL Radio. In 2009, he became the color analyst for US Naval Academy home games on CBS College Sports TV. 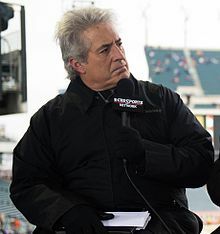 He is the former lead color commentator for New England Patriots pre-season games, from 1995-2012, alongside Don Criqui. Randy was a co-host of the midday show "Rick and Randy" with Rick Kamla on WZGC 92-9 The Game a CBS radio station in Atlanta, Georgia before being released from the station. Cross lives in Alpharetta, Georgia, with his wife, Patrice Cross, and their three children. Elder daughter Kelly graduated from University of Georgia and currently works for Levick Strategic Communications in Washington, D.C. She is married and has two daughters. Younger daughter Crystal recently graduated from Auburn University with a degree in BioMedical Science. His son, Brendan Cross, a graduate of Chattahoochee High School in Johns Creek, Georgia, played football for UCLA after transferring from Wake Forest University. Randy Cross's father, Dennis Cross (1924–1991), was an American actor, who had the lead role in the syndicated adventure series The Blue Angels (1960–61). ^ Tillman, Howard elected to college Hall of Fame, Associated Press, May 27, 2010. ^ "California State Meet Results - 1915 to present". Hank Lawson. Retrieved December 25, 2012. ^ "Registered & Protected by MarkMonitor". vault.sportsillustrated.cnn.com. ^ Nidetz, Steve (January 30, 1990). "In any language, this year's Super Bowl quickly became a colossal bore". Chicago Tribune. p. 4 (4). ^ "Wake Forest QB Brendan Cross transferring to UCLA". April 23, 2013. Wikimedia Commons has media related to Randy Cross.